The developers have added a new File Maintenance Routine, Rebuild Source Citations. To access it, go to File > File Maintenance > Rebuild Source Citations. If you are transferring sources from Legacy to FamilySearch, and you notice that your sources are missing, you will need to use this new file maintenance routine. It puts all of the citation parts into a single field (hidden, you don't see this) and then FamilySearch will pull from that field. Normally this field is filled in correctly but if you are manipulating sources for reports by excluding sources or suppressing source details this hidden field can get blanked out. This does not affect Legacy at all. The only time it will be an issue is if you are transferring sources to FamilySearch. If you don't use the FamilySearch interface you won't need to do this. Even if you do use the FamilySearch interface you may never need to do this. 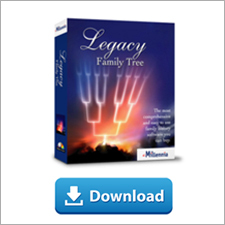 We have another great new update for our Legacy Family Tree 9 users (free) for you to download. It's mostly a maintenance update which provides fixes to minor issues you have reported to us. So download the update to get the best Legacy ever! View the April 19 release notes here. In my webinar titled “So, You’ve Found Your German Town of Origin, Now What?” I explain how to find the church records for your town if they have been digitized and placed online. But what if the church records you need are not available online? How do you find out where they are housed? You first need to know in what town the church was located. Armed with that information, you can begin your search. One example is Kreyenborg in the Kreis (district) in the former Kingdom of Hanover. The Catholic church for Kreyenborg’s residents was in Bokeloh, while the Lutheran church was in Meppen. I find that there is a GenWiki article about Bokeloh. There is a section about Kirchenbücher (church books) which has a link that leads to the archive that holds the microfilmed records. I will have to hire a researcher there. The first thing I would do is find the contact information for that archive and ask them for a list of researchers who regularly work there. Use Google Translate for help reading these websites. I find that there is a GenWiki article about Meppen, but it does not have information about where the Lutheran church books would be. The website that hosts GenWiki is called Genealogy.net. The Verein für Computergenealogie created this valuable tool. I can use the German Archive Portal and select all church archives in Niedersachsen, which is the modern German state where most of the former Kingdom of Hanover was. I find the Landeskirchliches Archiv der Evangelisch-lutherischen Landeskirche Hannovers and visit their website. I follow the link for Familienforschung (Family Research) and find that this archive does not have church records, but ultimately it leads me to the Evangelisch-lutherischer Stadtkirchenverband Hannover. I see in their holdings that they have Meppen records spanning 1842–1875. I will need to contact a researcher in the area to access these. I could also use the German Archive Portal to find Catholic archives. Select “church archives” and the relevant German state. Look for the words Bistumarchiv or Diözesanarchiv (both terms mean diocesan archive) in the resulting list. A quick way to find where all German Catholic diocesan archives are located is at the Catholic archive portal. Often, an archive will list their church book holdings on their website. This will help ensure you have chosen the correct archive. When in doubt, e-mail the archive with questions. If you are looking for a Lutheran church that was in East Prussia, West Prussia, Brandenburg East, Pomerania, Posen, or Silesia, your first stop should be the Lutheran Central Archive in Berlin. They have a large collection of Lutheran church books for these areas. They are gradually being digitized at Archion. Using Google is another option. For best results, I recommend using the German version at Google.de. This search will lead me to the GenWiki article discussed above. This same search could be used for Lutheran records, by substituting Evangelische for the word Katholische. That search does not immediately lead to information about the church books, however. You can see that there are several ways to conduct a search for church records in archives. Remember that online collections of church records continue to grow, so check frequently for changes. Contact the archives for lists of researchers. Happy Hunting! 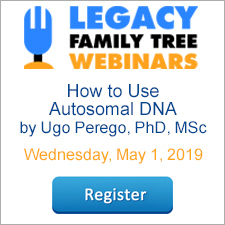 To learn more about finding records for your German town of origin see Teresa McMillin's most recent webinar or view any of Legacy's nineteen German-related classes. Teresa Steinkamp McMillin, Certified Genealogist®, author of the Guide to Hanover Military Records, 1514-1866 on Microfilm at the Family History Library, is the owner of Lind Street Research, a company dedicated to helping people discover their German ancestry. She is a popular speaker for national, regional, and local genealogical societies. Sometimes you will find duplicates on one of your Master Lists. It is easy to combine duplicates but you need to be aware of a couple of things. First some general information. How do you get duplicates in the first place? You can add them yourself if you are not careful but you can also get them when you do any sort of import (for example, a gedcom import or FamilySearch import/download). Every once in a while it is a good idea to take a look at your Master Lists to see if there is any cleanup needed. But here is a not-so-obvious example from the Master Source List. You wouldn't readily see this one because these two entries would not be right next to each other. This is why it is very important to be consistent with how you enter things. A tip for the Location Master List specifically — Make sure you SORT the list in all of the different ways you can because you will find more duplicates that way. Click the Sort button just below the list of locations. This is the only list that can be sorted in multiple ways. A tip for the Master Source List specifically — If you are using the SourceWriter templates, you can only combine duplicates if they were both created using the same template. If not, you will have to re-source the entries and then delete the duplicate. Before you get started, BACK UP YOUR FILE. Whenever you do anything that is going to have a global impact on your file you always want to create a backup first in case things don't go as planned. I am going to use the Master Location List as an example. You can see that I have two entries for Haverhill, Essex, Massachusetts. IMPORTANT — The first item you highlight will be the one that is lost and the second item you highlight will be the one that is retained. You need to decide upfront which one you want to keep. In the above screenshot I have decided I want to keep the second entry, Haverhill, Essex, Massachusetts, United States so the first entry (the one I don't want to keep) is highlighted. Now you can click the Combine button at the bottom. Notice that after you click Combine the button name changes to Combine With. Now select the entry you want to keep. After you have highlighted the entry you want to keep, click the Combine With button. Once you click the Combine With button you will now only see the one entry. Notice also the number at the top has changed from 124 to 123. Whenever you are combining duplicates take your time and think about what you are doing so that you don't accidentally keep the wrong entry. If you do, it isn't the end of the world. If I had accidentally kept Haverhill, Essex, MA, United States I would only need to edit that location so that it is correct. The problem you will have is if you accidentally combine something with an entirely different entry. For example, if I had accidentally combined Haverhill, Essex, MA, United States with Langley, Island, Washington, United States I would have a serious problem. I would have to restore to my backup. If you are doing a lot of global changes you will want to back up often so that if you make a mistake you won't undo all of the changes you made and have to start from scratch. You will only undo your last few corrections. Combining Duplicates is a very powerful database tool but make sure you follow the correct procedure.